Those who know me know I have a problem following rules or instructions. Like recipes. But I simply had to share what I could recall of what I did to make this scrumptious wild grape and crab apple jelly, made from the finest that Westboro and its environs have to offer. I started with a whack of grapes. Gave ’em a wash, then froze them. 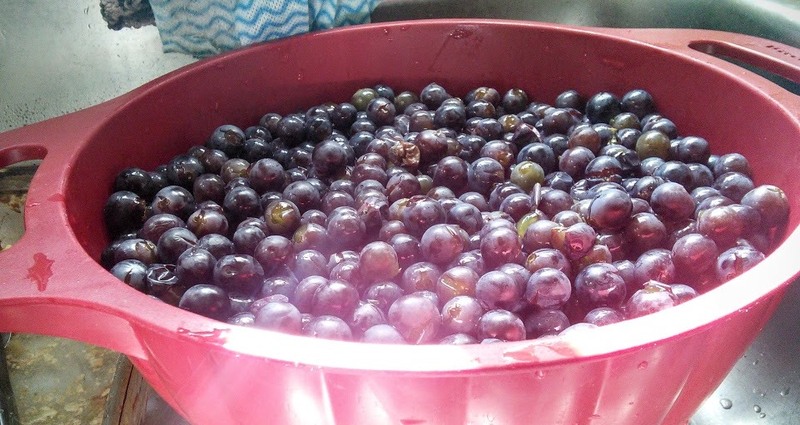 Whenever I want to make jelly, I haul out a bag of the frozen grapes and thaw them overnight in a colander with a bowl below. Thawing leaches a lot of the juice out of the fruit, and I just drink that. What’s left are the grapes, some all shriveled from the thaw, others still holding their shape, and all of those get chucked into a non-reactive pot. I bring these up to a boil then let them simmer for about half an hour or so. After a bit of a cooling down period, I chuck the mass into a cheesecloth and let it hang from a cupboard door, allowing the juice to fall into a bowl or pot below. After an hour or so of this, I squeeze all the juice out of it back into the pot. Wild grapes are very seedy, so for now I’ve been composting the mush. Some day I hope to get my paws on a ricer or a better sieve so I can squeeze all the pulp out, sans seeds, to make jam. But enough of my Christmas wish list, back to the jelly making. 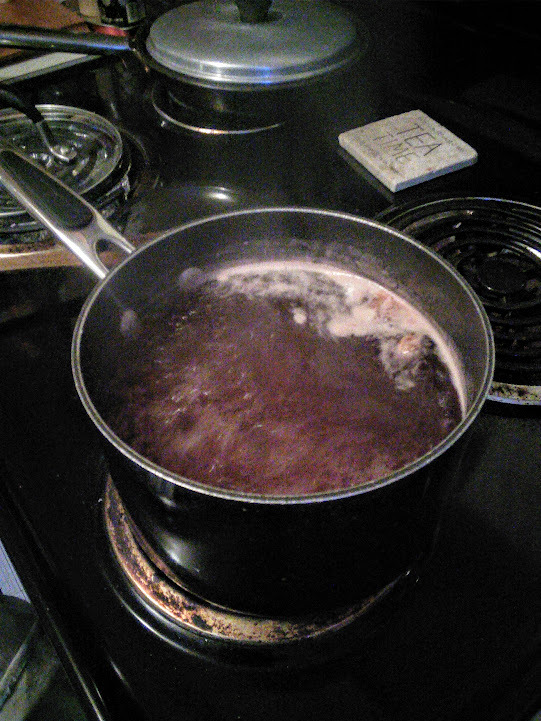 Bring the juice up to a boil, then chuck in the sugar. Most recipes call for about equal amounts of sugar to juice, but I find that’s waaay too much. I try to cut it back to about 3/4 cup of sugar per cup of juice; this does mean you’ll probably have to simmer it for longer. Bring the mix back up to a boil, then back down to a simmer. It can take a while to meet the “jelly test“. 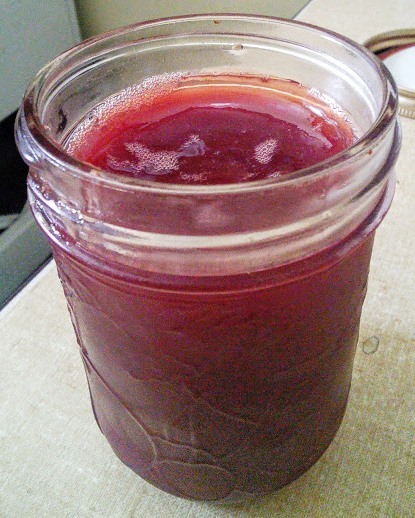 Because I was using wild grapes this time, which don’t have a lot of natural pectin, I used 3 cups of wild grape juice and 1 cup of concentrated unsweetened crab apple juice (which I also keep frozen and on hand for just such jelly making emergencies). I admit that this time I got a little impatient and chucked in a teaspoon of strawberry gelatin mix to speed things up. But you can’t argue with the results. Yum! I hope you made lots, I want to try this when I am back in town! I gave one of the three jars I made this time to the couple whose gave me the grapes, and John and I are almost through the second. Even if we pig out every day on it, I still have emergency stashes of frozen grapes and crab apple juice so I can always make more!